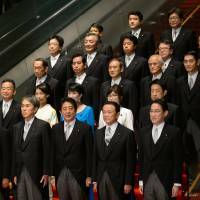 Which members of the Abe Cabinet deserve to be fired? It’s that time of year, and the hills of Nagatacho are alive with the sound of musical chairs — Japan’s leadership game with the objective of changing the subject, not the tune. Prime Minister Shinzo Abe has multiple reasons to pick this moment for a Cabinet reshuffle: the drip, drip, drip of scandals involving school operators from Osaka to Okayama; the unpopular conspiracy bill his ruling coalition railroaded through the Diet; the omnipresent and widely detested battle to amend the war-renouncing Constitution. And finally there’s Abenomics, which after five years hasn’t even boosted wages 2 percent, much less inflation. Not that it’ll do any good, but when the music stops who should be left without a chair if Abe really wants to reboot his government and stabilize his sliding support rate? Taro Aso: Yes, Abe needs the support of this 76-year-old power broker in faction-obsessed Nagatacho. That’s how Aso remains deputy prime minister despite his many verbal gaffes and penchant for dozing off in the Diet. But why not pass the finance portfolio off to someone with a touch more vigor and intellectual curiosity at a moment of upheaval in the global economy? Abe hasn’t achieved any of the structural changes he pledged in 2012. Even as labor markets tighten, wages are largely stagnant and corporate Japan clings to outdated norms like seniority-based promotion and pay. With zero progress on tax reform or innovation, and growth dependent on the developed world’s lowest interest rates and biggest debt burden, it’s no wonder foreign investors aren’t flocking this way. Nor does the Bank of Japan seem keen to bear even more of the burden of making Abenomics look like a going concern. And cozying up to U.S. President Donald Trump’s Treasury Department sure isn’t going to boost Japanese prosperity. Keep Aso around if you must, but let him snooze elsewhere as China eclipses Japan in startup activity on its way to dominating markets for renewable energy, self-driving cars and smartphone apps. Tomomi Inada: When a leader’s reformist persona is wrapped in a flag of feminism, it’s best if his defense secretary doesn’t create a sexist incident. Odder, still, if that Cabinet member is a woman. In Singapore recently, sharing a podium with two accomplished security peers from France and Australia — women who thought they’d long since broken through the glass ceiling and risen above the stereotyping fray — Inada motioned to her peers and said: “We have much in common. We belong to the same gender, we belong to the same generation, and most importantly, we are all good-looking!” Grimaces and groans all around at a comment foreign journalists in the room described as “bizarre” and “sexist,” according to the Asahi Shimbun. That cringe-worthy moment is a reminder of how Tokyo’s attempts at diplomacy are so often lost in translation. It’s a reminder, too, that Abe’s security messenger isn’t helping his cherished goal of increasing Tokyo’s global footprint. Who can forget Inada’s ill-timed visit to Tokyo’s controversial Yasukuni Shrine one day after accompanying Abe to Pearl Harbor? There’s also that South Sudan Self-Defense Forces peacekeeper data cover-up scandal. A changing of the guard might help. Katsunobu Kato: Lest you think I’m be sexist for suggesting Abe yank the chair from under the highest-profile woman in his Cabinet, let’s consider his odd choice of a man as minister of gender affairs — not to mention the lack of results on the guy’s watch. It’s not only the decline in Japan’s newborns that’s accelerated. Japan ranked 98th on the World Economic Forum’s gender-equality index in 2011. After five years of “empowering” the female workforce, Tokyo’s standing deteriorated to 111th, behind Ethiopia and Nepal. The “womenomics” portion of Abenomics is still more rhetoric than substance. Abe, or Kato, showing up at the odd gender conference to say women should “shine” is no match for changing corporate mindsets, mandated quotas, demanding more flexible schedules or doing more to offer affordable day care. 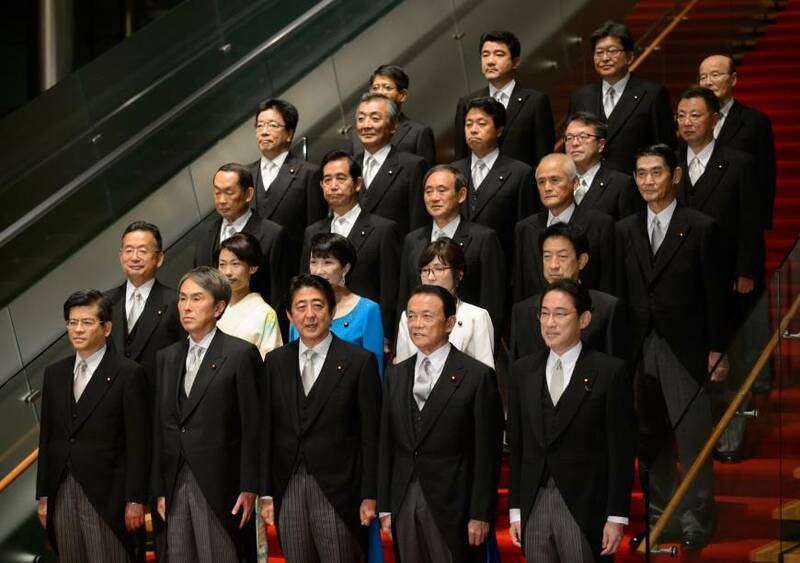 Abe’s World Assembly for Women — and its awkward “WAW!” acronym — is mere public relations. What about the policy revolution needed to alter the balance of power in patriarchal Japan? Time for a gender-equality minister? Who knows, maybe even a woman. There are myriad other names that could make my list. I’m not sure Justice Minister Katsutoshi Kaneda deserves a seat. He seemed to forget Japan isn’t China when keeping lawmakers and the media in the dark about the conspiracy crime law. Environment Minister Koichi Yamamoto is too wedded to the nuclear industry to see the boom in batteries and other renewables Japan could ride to unfathomable new riches. And what, with all due respect, has Foreign Minister Fumio Kishida really done to increase Tokyo’s diplomatic clout? Observe the inroads his Canadian counterpart Chrystia Freeland is making on that score as Trump walls off America from the world. Where’s Japan? If it really is musical-chairs time in Tokyo, let’s change the rhythm and make this round matter. Playing it safe and repeating the same tune won’t take the world by storm.